The best birthday gift I got yesterday was J.Crew’s email/tumblr post featuring my illustrations of J.Crew fashion director Gayle’s Travelling Tricks of the Trade. Of course I had a lovely weekend with my family too, apple picking, chilling in the country at my mom’s and then last night taking a rambling walk down 2nd Ave, grabbing dinner at an authentic Ramen place, strolling over the Williamsburg bridge and then eating a red velvet cupcake on a bench. What a gorgeous balmy autumn night/ the perfect birthday. 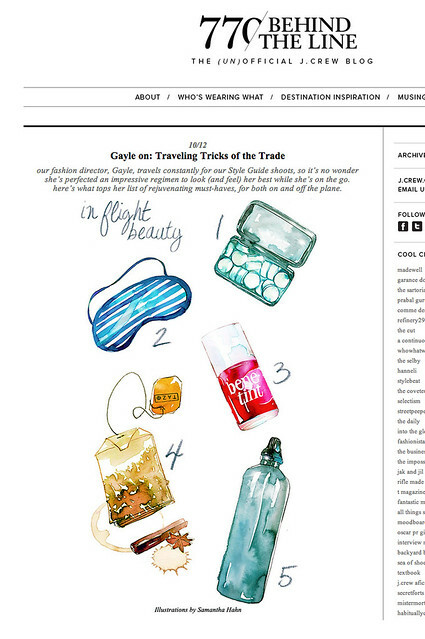 3 Responses to Gayle Spannaus’s in flight beauty tips- illustrated- on J.Crew! Beautiful illustrations and a prominent credit..congratulations!!!!! Happy birthday! 🙂 The illustrations are beautiful.